Theme Parks are the best places to let loose and have fun, especially if you have children. Bangkok has some of the best options in the world, and you are bound to find a great source of entertainment for the whole family. Siam Park City is the largest theme park in all of Bangkok. As a matter of fact, it has been rated among the twelve best theme parks in all of Asia by Forbes Magazine. There are enough things to do here for one to need to spend an entire day, maybe more. The park is divided into five main zones, the water park, the X zone, the family zone, fantasy world, and small world. The Vortex roller coaster in the X zone is one of the two largest Suspended Looping Coasters in the world and is an absolute must try. Another fun ride is the giant drop, that drops you from seventy-five metres high! Safari World was opened way back in 1988 and has been growing ever since. Currently, it houses an open space Safari Park through which you can take a car or a bus and enjoy the vast variety of animals roaming around freely. Here, four hundred and eighty acres are devoted to the open zoo, and a further one hundred and eighty acres are for the bird sanctuary. 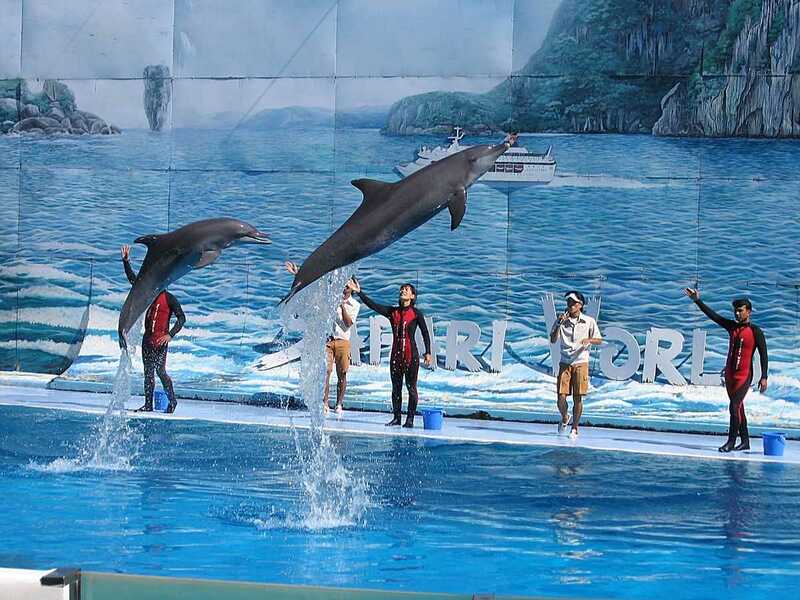 Apart from the Safari Park, the Marine Park is more like a traditional zoo, only mixed in with a large number of shows, food stalls and souvenir shops. At the park, you will get to see everything from crocodiles to antelopes and much more. The best attraction in the zoo, however, is the giraffe feeding platform where you get to feed the giraffes bananas by yourself. Dream World is an excellent destination for the entire family. With over fifty different rides for all age groups, no one is going to run out of things to do. Their all-inclusive packages allow you to access as many rides as you wish, as well receive a complimentary buffet lunch and shuttle transfer services to and from the park. Dream World is most known for its spectacular Snow Park which is the perfect place to cool down in the Thai summer heat. The Space Mountain roller coaster is also quite famous and draws in adrenaline junkies from across the country. KidZania is an entire replica city, just for four to fourteen-year-olds. The idea is that the kids can get to learn through role-playing and carry out supervised adult jobs. Many of these activities are carried out in coordination with major brands like Honda, Coca-Cola and Seven Eleven. The city has an airport, a bank, a hospital, a theatre, shops and much more. Kids can go wherever they wish and join in with others their same age to carry out fun tasks, learning essential life skills like confidence, respect and teamwork. The whole premises is continuously monitored, and the park guarantees the safety of every child. Snow Town is the first snow park to have been built in Thailand and arguably the best. Located inside the Gateway Ekkamai shopping mall, the park has thirty to forty centimetres of artificial snow. Inside the climate-controlled hall, there exists a Main Street that has Japanese restaurants, a playground and some other small shops. There is also a small hill along with sleighs that you can climb to the top and slide down from. The whole establishment is very well decorated and will make you feel like it is Christmas, all year round. Overall, it is a great place to chill out and enjoy the cold Northern weather, taking a break from Thailand's hot, tropical climate. Imaginia Playland is another great destination created for children to have a blast, while also learning essential life skills like teamwork and cooperation. The idea is for kids to learn through play. Nineteen different zones are spreading over one thousand four hundred square metres of the Emporium Mall. Each of these zones allows children to express their creativity in different ways, for example, the 'SoundCloud' zone allows kids to try their hand at DJing. The 'Dream Jungle' is another fun area made with a bunch of bouncy nets for children to try to climb to the top of. If you find yourself in Bangkok with nothing to do, or if you're tired of your children complaining all the time, definitely drop by one of these fantastic theme parks for a great time for the entire family. 12 Bangkok Nightlife Experiences That Will Keep You Up All Night!